Gov. Peter Shumlin announces his third run for governor Tuesday in Burlington. Updated at 10:10 a.m. with audio of Shumlin's first radio advertisement of the campaign season. Gov. Peter Shumlin's campaign for a third term promises to be a mighty "bold" affair. The word of the day — and likely of the two months remaining until Election Day — made an early appearance Tuesday afternoon as Shumlin kicked off his reelection bid at Burlington's Main Street Landing. 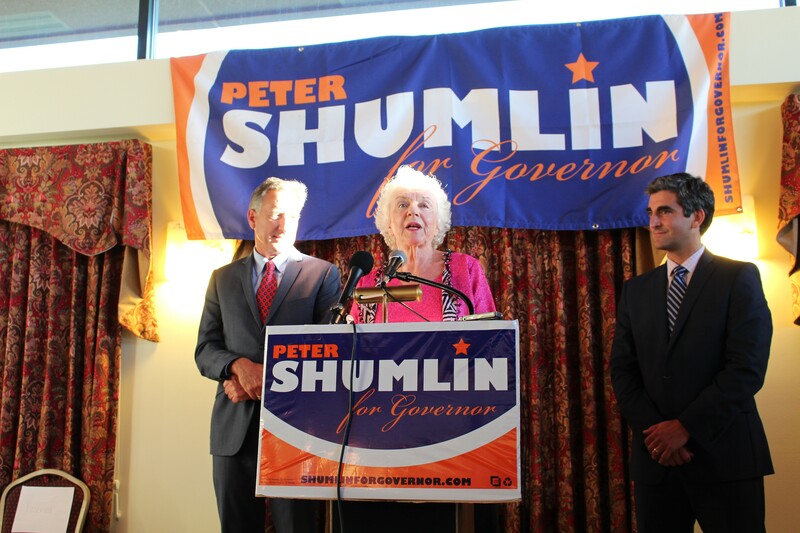 Standing before a robust crowd of administration officials, fellow politicians, Montpelier lobbyists and Democratic Party activists, Burlington Mayor Miro Weinberger previewed Shumlin's bold new message as he introduced the governor. "I've heard one of the governor's opponents criticize him for being too bold, for being too innovative, for pushing too fast in his efforts to improve the lives of Vermonters," the mayor said. "These attacks make me wonder: Why would we want anything else? Why would we opt for timid over bold? And why would we want to go back to those days — those eight long years before Gov. Shumlin — when our government stood still, failing to address the challenges Vermonters face?" No, Weinberger said, "What we want is more bold, innovative efforts — more strong leadership and more doing things the Vermont way." Former governor Madeleine Kunin, who followed Weinberger to the podium and took a turn introducing the gov, echoed the mayor's enthusiasm for gubernatorial boldness. "Tough and being bold, which is what leadership means," Kunin said. "You know, sticking your neck out somewhere, but then making sure that people are with you at the same time, and that is a talent that Peter Shumlin has. He is innovative, he is creative, but he always touches base with all of us." And did she mention he's a pretty bold guy? In his own remarks, Shumlin harkened back to the day, four years earlier, when he faced off against then-lieutenant governor Brian Dubie in another race that, as he remembered it, pitted timidity against boldness. "We knew that being bold was the only way that Vermont was going to continue to be — as my friend, [Agency of Natural Resources] Sec. Deb Markowitz, said so many times — the best state in the nation to live, to work, to raise a family," he said. Boldness, he said, means creating jobs. It means investing in education. It means promoting renewable energy. It means preventing and treating drug abuse. "And yes, yes," Shumlin continued. "It means having Vermont join every other developed country in the world in treating health care as a right of birth and not a privilege of station in life or employment. That's what it is. That's being bold!" Offering an unambiguous assurance that he would not — as his critics have suggested — walk back his pledge to provide universal health care, Shumlin said, "I was elected to get tough things done, and this may well be the toughest, but I will not rest until it is done." Also bold was his assessment of his top two rivals, whose ideas, he said, "are wrong for Vermont" and would "take us and our state backward." Wait, two rivals? That's right. Shumlin spent just as much time, if not more, slamming Libertarian Party nominee Dan Feliciano as he did Republican nominee Scott Milne. That's hardly an accident. The ever-clever governor clearly sees the opportunity presented by Feliciano's third-party run. The Libertarian showed a knack for siphoning off Republican votes when he ran against Milne as a write-in candidate in the GOP primary. By lavishing attention on Feliciano, the governor appears to be fanning the flames of conservative discord. "One of my opponents thinks that Vermonters don't have a right to health care," Shumlin said of Feliciano. "His idea of health care reform is to tell Vermonters, 'You're on your own. Good luck and fend for yourself.'" "Another one really doesn't have an opinion," Shumlin said of Milne. "He says he's, quote, 'agnostic' — whatever that means. And he said he'll make up his mind and let you know how he feels perhaps sometime after the election." 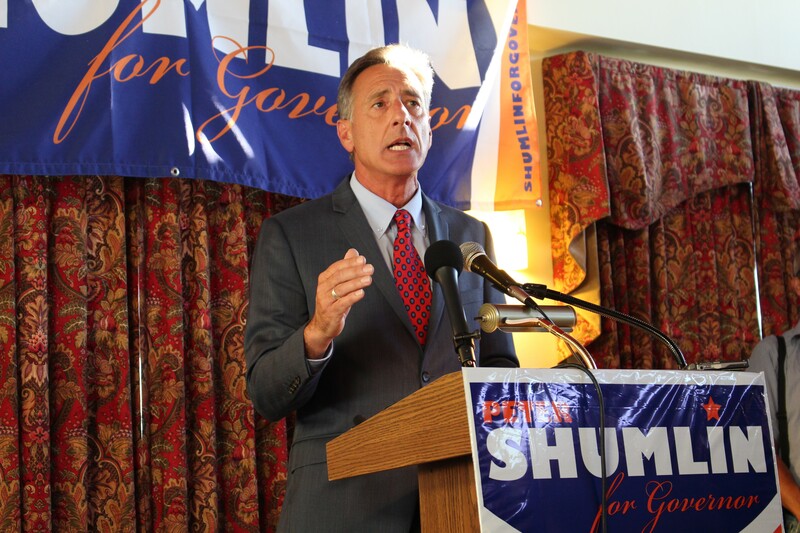 No, Shumlin said, there's nothing bold about either candidate. "They're against pretty much everything you and I are for. That's the brutal truth," he said. "They live in a world of 'no.' In the case of my Republican opponent, that means 'no positions on issues.' I wonder sometimes if my Republican opponent has any ideas other than 'no' that he's willing to share with the rest of us." "In this election," Shumlin concluded, "I'm going to be asking Vermonters to continue to say 'yes' to progress, to equal opportunity, and to make the bold choices that will lift incomes for middle-class, working Vermonters and keep Vermont moving up. That's what this campaign is all about. That's what it's about." It's about boldness. In case you missed it. The day after formally announcing his reelection bid, Shumlin released his first radio advertisement of the campaign — and that, too, is pretty bold. The minute-long ad covers all the bases: creating jobs, cutting red tape, making college more affordable, requiring GMOs to be labeled. It’s unclear whether Shumlin’s bold new ad is actually playing on the radio yet. We'll let you know when we hear back from his campaign.